Stalagmites and stalactites festoon the interior of these impressive limestone caves, together with shrines to Hindu deities. American naturalist, William Hornaday, is credited with discovering them in 1878, though they were already known Chinese settlers and local indigenous peoples. The caves have since become a Hindu holy site. They're especially relevant to the celebration of a three-day religious festival called Thaipusam. Thousands of devotees visit during the festival, paying penance and performing rites of self-flagellation. Visitors can reach the largest cave, Temple Cave, by climbing 272 steps. The path will lead them to Museum Cave, which houses a dazzling display of ornamental religious art. 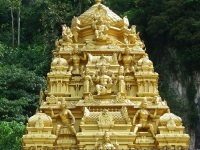 Travellers will enjoy the clear view from the top to the Sri Subramaniam Temple. Onsite companies offer rock climbing opportunities as well. Travellers who're interested should pack water, as the routes are challenging. Visitors should also watch out for monkeys, as they tend to steal things.